Converts into a Stamina ability and increases your damage done with Light Attacks. Passively grants Minor Ward and Minor Resolve. Bound Armaments: Cost: 3240 Stamina. Protect yourself with the power of Oblivion, creating a suit of Daedric mail that increases your block mitigation by 36% for 3 seconds. While slotted, your Max Stamina is increased by [5 / 6 / 7 / 8]% and light attack damage is increased by 11%. Bound Aegis: Protect yourself with the power of Oblivion, creating a suit of Daedric mail that increases your block mitigation by 36% for 3 seconds. While slotted, your Max Magicka is increased by [5 / 6 / 7 / 8]% and you gain Minor Ward and Minor Resolve. These increase your Spell Resistance and Physical Resistance. Bound Armor protects you with magical Daedric armor, which increases your Physical Resistance. The armor remains until you activate the ability again to unsummon it. While active, your Maximum Magicka is increased by 5%. Bound Armaments changes both the casting cost and the maximum stat increase to use Stamina instead, and also increases the damage from your Heavy Attacks, while the Bound Aegis morph adds Spell Resistance. Unlike previous games in the series, this spell adds protection in addition to your regular armor, rather than replacing it. Bound armor is not damaged by attacks and will last as long as you leave it on. However, your regular armor will still receive damage if you are attacked or killed while using Bound Armor. Bound Armor must use up one of your action slots in order to work. You cannot cast it and then replace it with another skill or use your weapon swap to free up the slot. 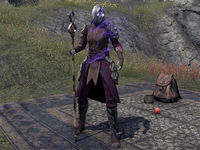 Prior to Update 10,[verification needed] this caused your entire visual appearance to change, covering you in Daedric-style armor. Now, you just see a purple smoke around your torso, meaning that two Sorcerers both using this spell are no longer forced to look identical. Bound Aegis is a recommended morph for the Sorcerer Initiate, Elemental Arcanist, War Mage, and Eldritch Mender builds, while Bound Armaments is recommended for Arcane Warrior. This ability now grants you the buff Minor Resolve, and increases your maximum magicka by 5%. This bonus magicka does affect your ability damage. The cost of the ability decreases with each rank of Bound Armor. Bound Armaments: This ability now costs Stamina instead of Magicka, gives you a bonus to stamina instead of magicka, and increases the damage done by heavy attacks. Bound Aegis: This ability now grants the Minor Warding and Minor Resolve buffs instead of additional armor. Fixed an issue where Bound Armor would be removed if you put on a costume from your Collections tab. You may now hide your Bound Armor as you please, by putting on a costume. This ability and its morphs no longer permanently change your appearance when they are toggled on; instead, they now only display a brief visual effect when toggled on. Fixed an issue where this ability and its morphs could become stuck on your character. This ability and its morphs are no longer toggle abilities. Slotting Bound Armor will continue to grant you an increase to Max Magicka, and activating these abilities will increase the amount of damage you can block by 20% for 3 seconds. Bound Aegis: This morph now grants Minor Ward and Minor Resolve while it is slotted. Bound Armaments: This morph converts the ability into a Stamina ability and now increases your damage done with Light Attacks while slotted, instead of Heavy Attacks. Increased the bonus to block mitigation granted by this ability and its morphs to 36% from 20%. This page was last modified on 10 November 2018, at 23:43.